These Stunning Crystal Healing Gardens come with a beautiful crystal, air plants and tumbled crystals and stones to line the bottom of the sphere. 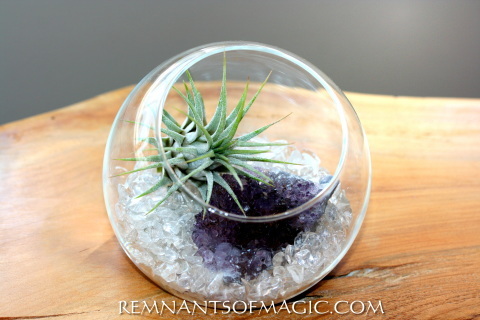 Healing crystals with a lovely Tillandsia air plant, yes it's real and yes it needs water, just no soil. These crystal Healing Gardens promote peacefulness, happiness, balance and healing. NOTE: *This is an example of the plant & crystal you will receive. This is a natural product and every one varies and is unique. Crystal could be larger or a little smaller, each one is unique & beautiful. 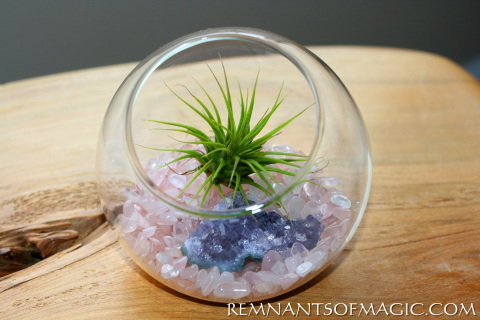 This crystal healing garden comes with a Air plant, small amethyst cluster and tumbled quartz crystals to cover the bottom of the glass sphere. There will be some Assembly required when it arrives in the mail. Everything will be wrapped separately to avoid damage in shipping. These make great gifts and give a nice positive clearing energy to any space. ​​Amethyst is a meditative and calming stone which works in the emotional, spiritual, and physical planes to provide calm, balance, patience, and peace. Amethyst can promote peacefulness, happiness, and contentment. A bringer of hope in times of despair. ​Quartz is a stone of clarity which dispels negativity and clears away negative energy. It can be used to purify and clarify on the spiritual, mental, and physical planes. It is powerfully protective and enhances spiritual growth, spirituality and wisdom. It can also help particularly with concentration, studying, and retaining what one learns. Quartz is also a stone of harmony because it balances energies. 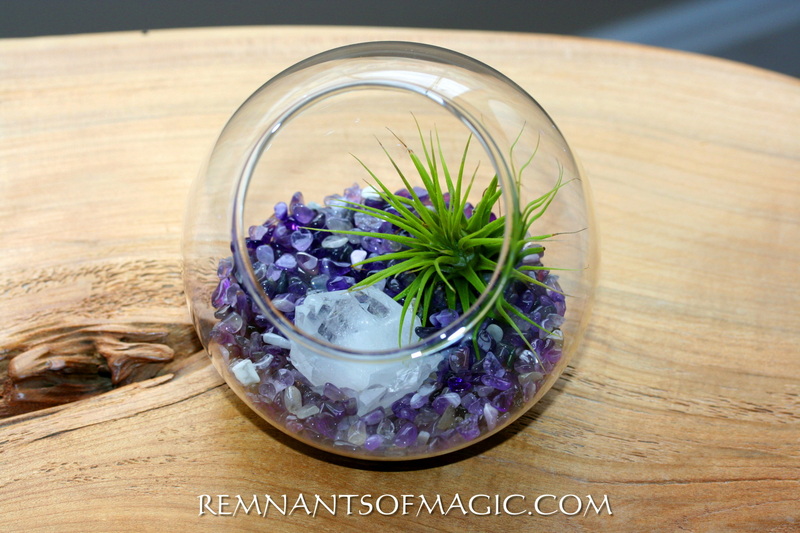 This crystal healing garden comes with a Air plant, Quartz Crystal and tumbled Amethyst stones to cover the bottom of the glass sphere. There will be some Assembly required when it arrives in the mail. Everything will be wrapped separately to avoid damage in shipping. 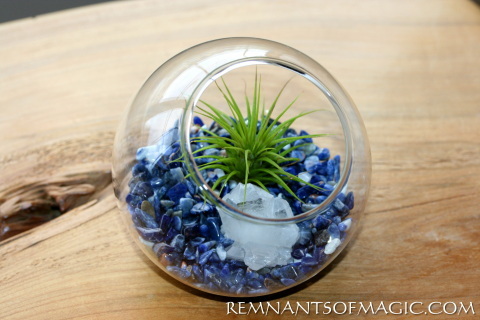 These make great gifts and give a nice positive clearing energy to any space. Quartz is a stone of clarity which dispels negativity and clears away negative energy. It can be used to purify and clarify on the spiritual, mental, and physical planes. It is powerfully protective and enhances spiritual growth, spirituality and wisdom. It can also help particularly with concentration, studying, and retaining what one learns. Quartz is also a stone of harmony because it balances energies. This crystal healing garden comes with a Air plant, Quartz Crystal and tumbled Black Tourmaline stones to cover the bottom of the glass sphere. There will be some Assembly required when it arrives in the mail. Everything will be wrapped separately to avoid damage in shipping. These make great gifts and give a nice positive clearing energy to any space. Black Tourmaline, is associated with the root or base chakra, and is excellent for grounding excess energy. It is well known as a purifying stone that deflects and transforms negative energy, and thus is very protective. It can transform and remove negativity from an individual or an environment. It is often used as an aura cleanser, and can help one attain higher levels of awareness. 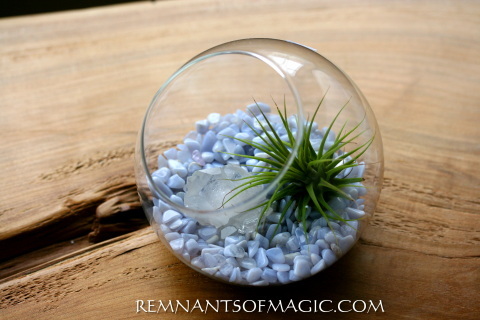 This crystal healing garden comes with a Air plant, Quartz Crystal and tumbled Blue Lace Agate stones to cover the bottom of the glass sphere. There will be some Assembly required when it arrives in the mail. Everything will be wrapped separately to avoid damage in shipping. These make great gifts and give a nice positive clearing energy to any space. as well as one of hope. 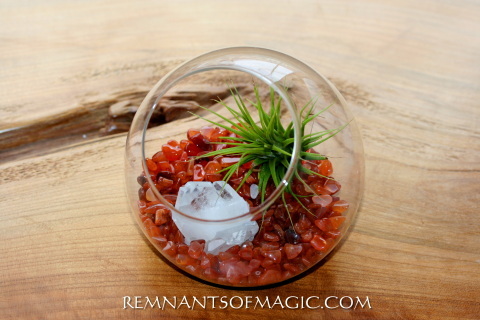 This crystal healing garden comes with a Air plant, Quartz Crystal and tumbled Carnelian stones to cover the bottom of the glass sphere. There will be some Assembly required when it arrives in the mail. Everything will be wrapped separately to avoid damage in shipping. These make great gifts and give a nice positive clearing energy to any space. This crystal healing garden comes with a Air plant, Quartz Crystal and tumbled Fluorite stones to cover the bottom of the glass sphere. There will be some Assembly required when it arrives in the mail. Everything will be wrapped separately to avoid damage in shipping. These make great gifts and give a nice positive clearing energy to any space. Fluorite is a great stone to calm and relieve anxiety, tension, and stress. Fluorite can reduce fear of the future as well as ease anger and depression. Fluorite is a stone of mental order and clarity, used to enhance mental clarity and reduce instability and disorder. Fluorite promotes spiritual and psychic wholeness and development, protection, and brings peace. This crystal healing garden comes with a Air plant, Quartz Crystal and tumbled Labradorite stones to cover the bottom of the glass sphere. There will be some Assembly required when it arrives in the mail. Everything will be wrapped separately to avoid damage in shipping. These make great gifts and give a nice positive clearing energy to any space. Labradorite is a stone of transformation and magic. It is said to clear, balance and protect the aura, as well as being an excellent stone for general protection. It can provide clarity and insight into your destiny, as well as attract success. Relieves stress and anxiety and increases energy and self-confidence. Labradorite is also said to increase intuition, psychic development, esoteric wisdom. 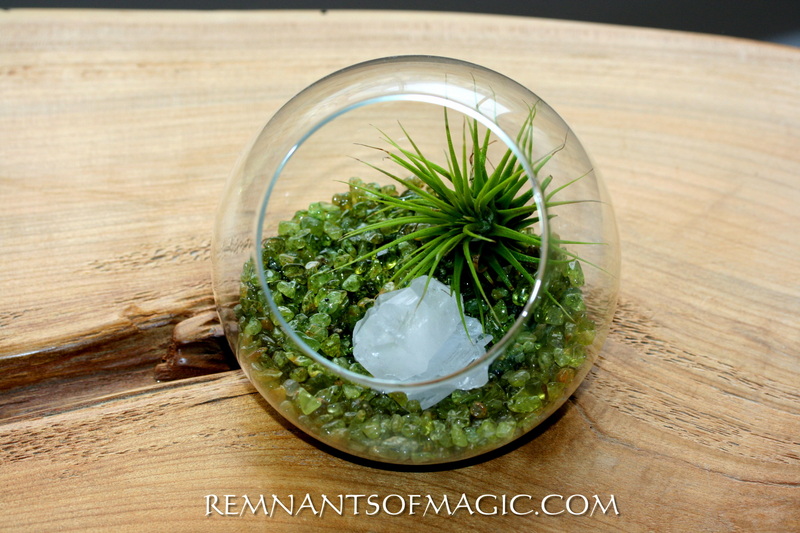 This crystal healing garden comes with a Air plant, Quartz Crystal and tumbled Peridot stones to cover the bottom of the glass sphere. There will be some Assembly required when it arrives in the mail. Everything will be wrapped separately to avoid damage in shipping. These make great gifts and give a nice positive clearing energy to any space. Peridot Stimulates the heart. Brings openness and acceptance in the intellectual pursuit of love and relationships. Helps one in recognizing patterns of one's life so that growth can occur. Heals a bruised ego by lessening anger or jealousy. 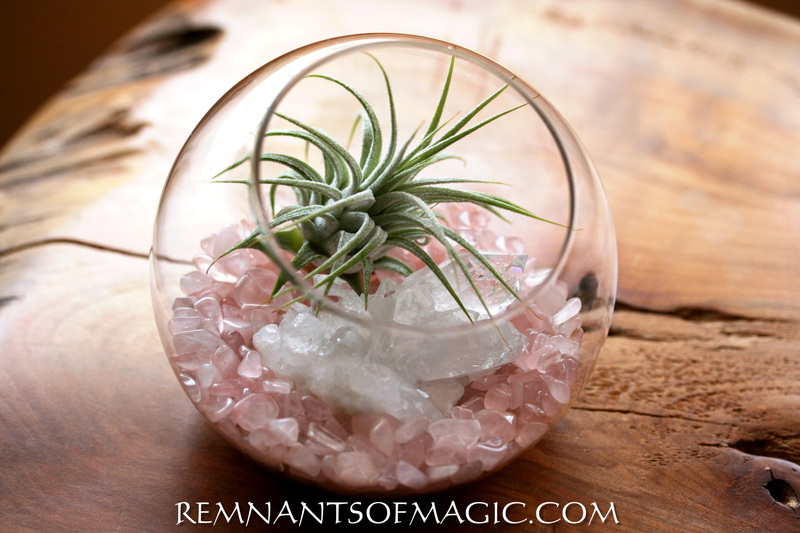 This crystal healing garden comes with a Air plant, Amethyst Crystal and tumbled Rose Quartz stones to cover the bottom of the glass sphere. There will be some Assembly required when it arrives in the mail. Everything will be wrapped separately to avoid damage in shipping. 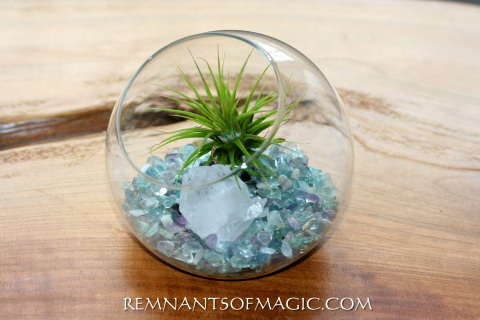 These make great gifts and give a nice positive clearing energy to any space. 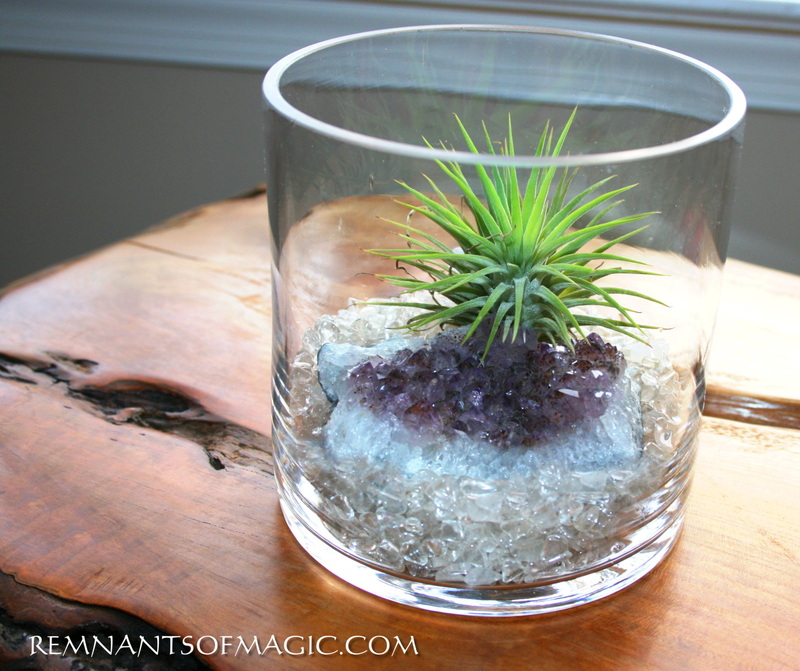 This crystal healing garden comes with a Air plant, small Quartz cluster and tumbled quartz crystals to cover the bottom of the glass vase. There will be some Assembly required when it arrives in the mail. Everything will be wrapped separately to avoid damage in shipping. 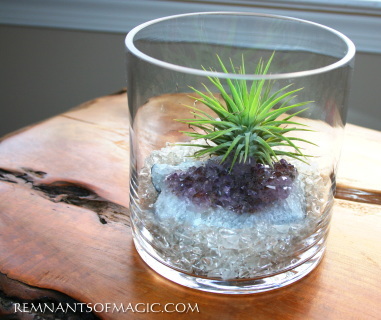 These make great gifts and give a nice positive clearing energy to any space. Rose Quartz This is the stone of unconditional love that opens the heart chakra to all forms of love: self-love, family love, platonic love, and romantic love. The high energy of quartz gives rose quartz the property of enhancing love in virtually any situation. Bringing love in to life and daily situations not only brings inner warmth, but it also lowers stress and soothes those around it. Rose quartz is a very happy and loving stone. 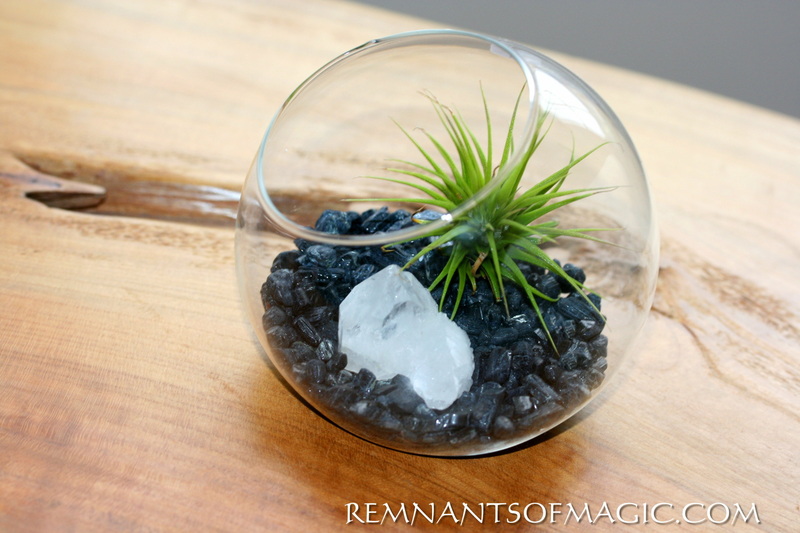 This crystal healing garden comes with a Air plant, Quartz Crystal and tumbled Sodalite stones to cover the bottom of the glass sphere. There will be some Assembly required when it arrives in the mail. Everything will be wrapped separately to avoid damage in shipping. These make great gifts and give a nice positive clearing energy to any space. A stone of self-expression and confidence, Sodalite can aid in issues of self-worth, self-acceptance and self-esteem. It promotes intuition and a trust in one's own judgment. It helps to achieve emotional balance.It also helps to release old patterns which no longer serve. This crystal healing garden comes with a Air plant, small amethyst cluster and tumbled quartz crystals to cover the bottom of the glass vase. There will be some Assembly required when it arrives in the mail. Everything will be wrapped separately to avoid damage in shipping. 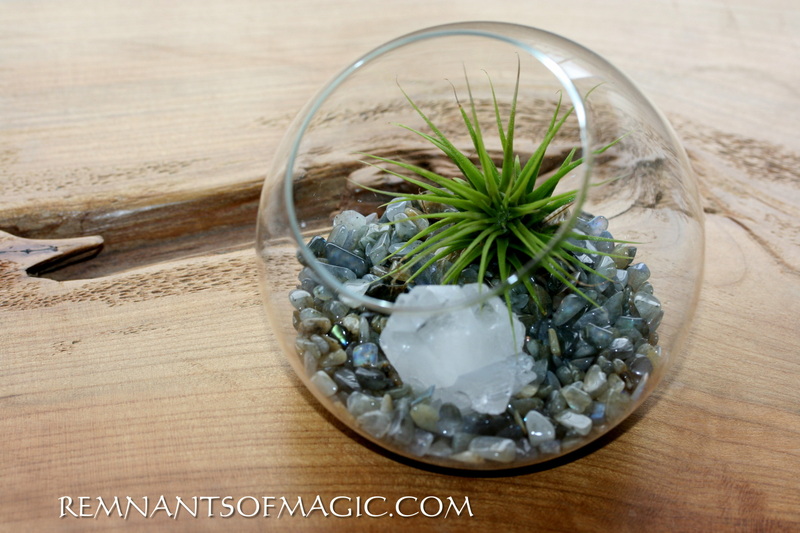 These make great gifts and give a nice positive clearing energy to any space. ​Amethyst is a meditative and calming stone which works in the emotional, spiritual, and physical planes to provide calm, balance, patience, and peace. Amethyst can promote peacefulness, happiness, and contentment. A bringer of hope in times of despair. Copyright © 2010-2019 All rights reserved. The Copyright is owned by Remnants of Magic/Matthew Sullivan unauthorized copying of this site or pictures is strictly prohibited.